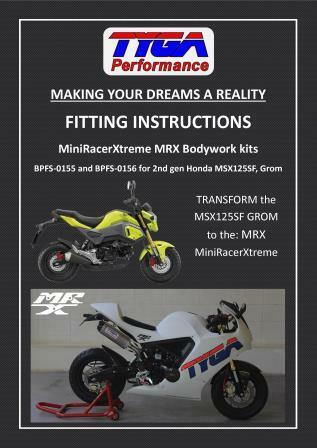 The MRX kits shown here are supplied with everything you need to transform your MSX125 Grom into a MRX (MiniRacerXtreme). All the components shown in the product page are included and no cutting or modification of the stock Honda components is required making the kit easy to install and totally reversable. We also recommend at the time of your purchase to consider some of our other products such as rear sets, front indicators to finish off your build. These can be found in the 'Compatible Products' category along with other tempting components such as engine armour, front fenders huggers. etc. Tyga Performance offers you a choice when it comes to the MiniRacerExtreme (MRX). The kits are available in both GRP and carbon fiber. The carbon fiber is the ultimate in terms of strength and beauty and is finished in a UV resistant clearcoat finish. No painting is necessary. The GRP is supplied sanded and primed and requires minimal preparation before painting. We only use the best imported epoxy resins in the construction of these kits for the optimum strength and flexibility. Most GRP motorcycle parts use polyester because it is a lot cheaper than epoxy but we won't compromise when it comes to our composites. In addition, all mounting components and hardware are laser cut and handwelded and finished to a very high standard.